A combination brush system such as the Flexicomb and straight finishing brush combination which can be used on both sand and rubber filled surfaces. 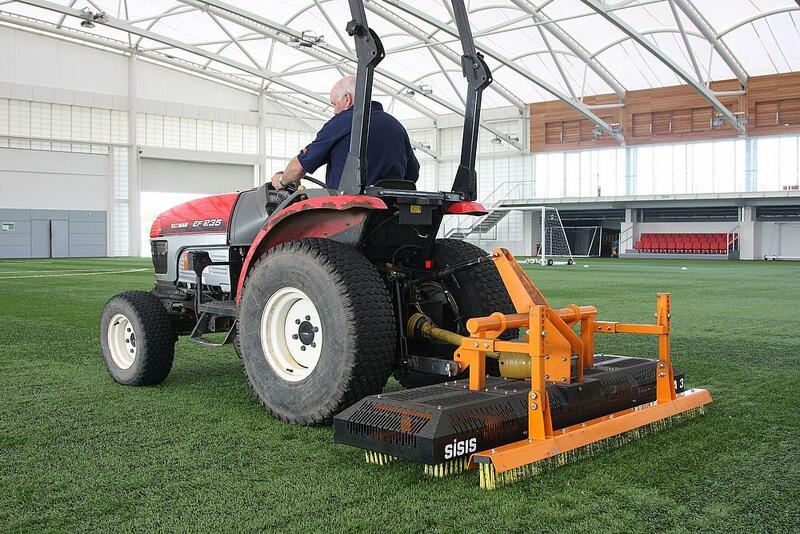 The SISIS Brush-Pro is used by some of the UKâ€™s top venues. The Osca 3 has two oscillating brushes to stand the carpet fibres up and re-distribute the infill evenly. Here Jason Briggs from SISIS, the British manufacturer synonymous with quality synthetic maintenance equipment, gives advice on how to prolong the life of your synthetic surface. Turf Business: Why is it necessary to maintain a synthetic pitch and in what ways does regular maintenance benefit? JB: Quite simply, it is necessary to maintain a synthetic pitch because it ensures a safe playing environment, retains the performance characteristics as well as prolonging the longevity of the surface. It is also a key factor in protecting the warranty offered by the manufacturer and installer. Maintaining a synthetic pitch ensures it is clean and free draining keeping the people using the surface happy. It is essential that a correct maintenance regime is implemented as soon as possible from installation. Turf Business: In your experience, do most people maintain their pitches sufficiently? JB: Budget, staff, machinery and time are probably the four limitations of maintenance for most, along with a lack of understanding of what type of maintenance is required. Once thought of as all-weather and maintenance free, it is now clear this is not the case, so education is very important so everyone is aware of what the on-going maintenance requirements and costs will be to keep the surface in a good condition. Prevention is far better than the cure, but often people tend to wait for a problem to occur before implementing the right maintenance programme. Often the pitch isn’t freed up long enough for maintenance to happen particularly in dual-use situations where there can be some conflict between usage/availability. There can often be confusion between the different maintenance ‘brushing’ processes available. Drag brushing does not clean the surface; it is merely designed to agitate the surface lifting the pile and redistributing the infill. This can generally be carried out in-house with a good small drive unit and static brush. The other brushing technique is often referred to as power or rotary brushing. This helps clean the surface and infill of accumulated detritus and dirt. The more regular this is completed; the less opportunity there is for it to decompose and contaminate the lower reaches of the surface. TB: How often should I brush a synthetic surface? JB: Brushing should be carried out at least on a weekly basis, possibly even two or three times, depending on the amount of play. The infill is then distributed evenly across the surface keeping it true. Turf Business: What synthetic maintenance equipment do you recommend? JB: I would recommend using a combination brush system such as the Flexicomb and straight finishing brush combination which can be used on both sand and rubber filled surfaces. It ensures an even distribution of infill and lifts the pile whilst the straight brush provides a level finish. For 3G surfaces which have a rubber infill and require a more aggressive brush, this can be achieved by adjusting the crossbar which stiffens the bristles. The combination unit can be towed or mounted so is suitable for all types of power units. 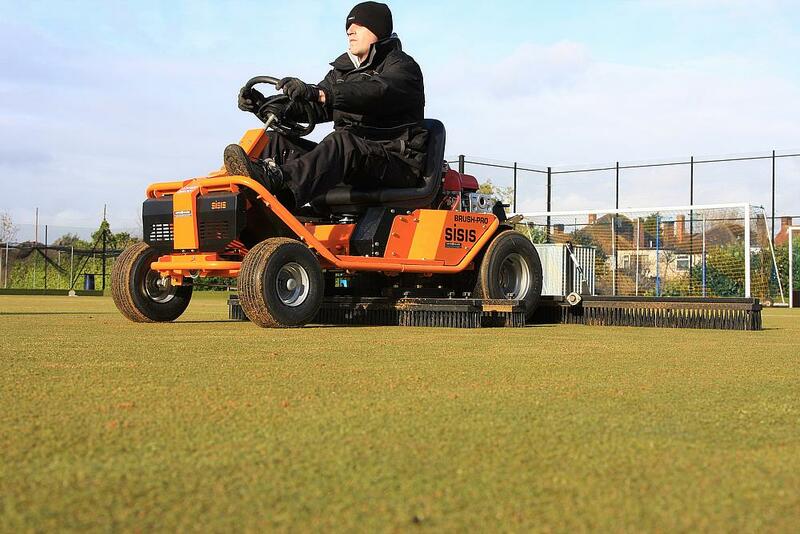 If you want a dedicated ride-on brush system, you should definitely look at the SISIS Brush-Pro, which is used by some of the UK’s top venues. Designed specifically for use on synthetic surfaces, the Brush-Pro consists of a pair of mid-mounted oscillating brush units and three rear mounted fixed brushes. The SISIS Brush-Pro can also be fitted with the SSS1000 – a tractor mounted sweeper. This machine will brush Debris into the hopper whilst the pitch infill is returned to the surface removing any chance of contamination. Finally, we have our hugely popular tractor mounted powered brush – the Osca 3. 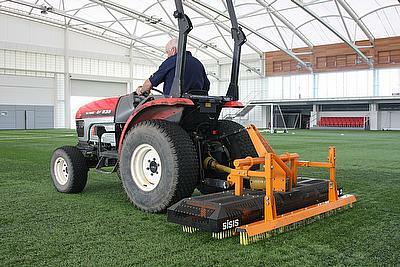 This machine is a tractor mounted powered oscillating brush with a 1.9 meter working width and is equally effective when used on artificial turf with sand or rubber infill. The two oscillating brushes stand the carpet fibres up and re-distributes the infill evenly, minimising compaction on the surface and improving its performance – giving consistent playing characteristics whilst preventing pile damage caused by reduced infill levels. To complement the final result an additional brush can be fitted to the rear of the unit. One such user is St. George’s Park who were recently awarded the Institute of Groundsmanship’s (IOG) Best Maintained Artificial Pitch of the Year with Grounds Manager Alan Ferguson acknowledging the SISIS Osca as being integral to winning the award. Turf Business: What are the most common issues that you come across as a result of pitches not being maintained? JB: The most common issues that I come across as a result of a pitch not being maintained is a buildup of surface debris, litter, weeds & moss. You will also see a flat carpet pile, compacted infill (rubber or sand) and an uneven infill distribution. Worn and damaged sections of carpet particularly in high use areas (penalty spots, goalmouths etc.) are also a good indicator of little or no maintenance. With older pitches you will also see poor drainage during wet weather with resultant dark silt patches left on the surface once the water does eventually drain away. Turf Business: In your opinion, how often should a synthetic pitch be maintained? JB: I would always recommend following the carpet manufacturer’s guidelines and log hours of maintenance and use wherever possible. The accepted industry standard is that for every ten hours of pitch use, then you need to allocate one hour of maintenance, although this figure can vary with the size of surface, extended hours of play and actual footfall. 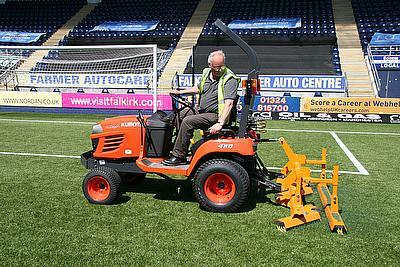 Turf Business: What are you top three pieces of advice regarding pitch maintenance? 1. Allocate an annual budget for the maintenance of the surface from the outset. 2. Ensure that the maintenance of the pitch is carried out frequently and effectively - and is right for your surface. 3. When you purchase maintenance equipment, make sure that it is specified for your surface.